I hope you had a nice Father's Day weekend! Ours flew by with the usual errands and to-do's. The weather wasn't very cooperative at first but then the sun broke out yesterday, which I thought was very appropriate. We enjoyed a nice, relaxing Father's Day, celebrating with family time and some treats. I mentioned in my last post that when I asked my husband what type of dessert he'd like for Father's Day that he, surprisingly, picked the matcha-almond sponge layer cake that I attempted last month (after first reassuring me that I didn't have to make him anything but of course, I couldn't have that!). I was a little taken aback by his choice but despite the mishaps I had, the essence of that cake really was very tasty and memorable. I don't think my husband felt like he got enough of a taste last time to satisfy his craving and he'd been thinking about it. So I went into the kitchen Saturday and had a little re-do of that recipe! Mainly, I baked the matcha-almond sponge cake in a rectangular 9x13 inch pan instead of the larger 12x16 inch type sheet pan. I simplified and streamlined the process a bit and things went according to plan. Baking the cake in the smaller pan gave me the thicker layers I was looking for so that the cake wasn't invisible-thin and I could move and maneuver it a lot easier. I sliced the baked sponge cake into just 3-pieces and stacked them with 2 layers of cocoa whipped cream in between. This time we have 5 very-manageable layers instead of 15! With the little changes and tweaks, these layer cakes were really easy and quick to put together (dishes and cleanup are a different story). I literally made the batter and baked the cake in between cooking breakfast and prepping other things. So I call it a success, and I wanted to share this little re-do and my revamped version of this recipe. Now that I've got it figured out - in a way that works for me - I'm glad I'll be able to whip this dessert up any time someone has a craving for it. The cake layers are so moist and feather-light. The mild and delicate flavor of the soft cake layers meld really well with the creamy filling, which adds some sweetness and a lot of flavor. I'd say my husband has pretty good taste, and he heartily enjoyed his Father's Day treat. And I'm so glad I did this re-make. With the essence of this recipe worked out, I feel like there are opportunities to play with the filling. Sprinkle Bakes' suggestion of a creamy red bean filling sounds very enticing to me since the combination of green tea and azuki or red beans is a classic one in Asian desserts; however, my husband insists this is perfect just as it is! Baking the foamy cake batter in a 9x13 baking pan worked well (it only takes about 5 minutes in a 425 degree oven). Looking back, I almost can't imagine how I had any cake at all baking it in a sheet pan last time! I sliced my cake into 3 pieces (instead of 4 per the recipe using a larger sheet pan). As I learned from my first experience, the cake is quite sticky so flip it out onto a piece of parchment paper instead of directly onto a cooling rack. This makes moving it around a lot easier. I slathered my cocoa whipped cream filling onto two layers and stacked them on top of each other. Let it chill for an hour or so in the fridge before slicing and serving. 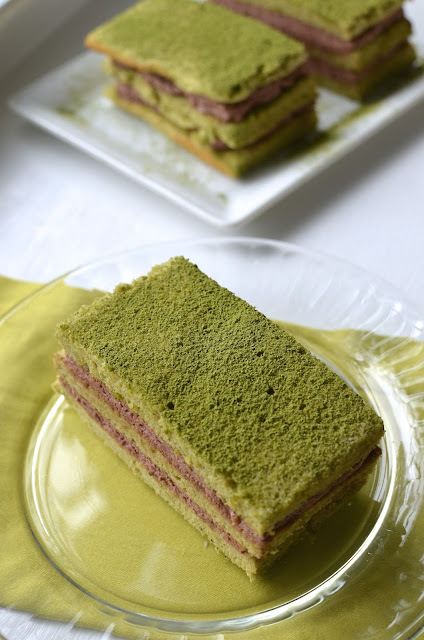 Simply dusting some matcha powder on top of the cake makes for an easy decoration; the extra dusting also reinforces the green tea flavor nicely. If you feel more confident than I do, trim the sides of the cake for a neater presentation. I didn't want to mess with it too much given my history. I sliced the cake into 4 portions. This is something of a small-batch recipe. I know my husband enjoyed the "accidental" 15-layer concoction I made last month but I have to tell you...this is much easier to make! Looking back, I think I got lucky in salvaging that endeavor. Make matcha-almond sponge: Preheat oven to 425 degrees. Butter a rectangular 9x13 inch baking pan. Line with a piece of parchment paper and butter the paper. In a stand mixer fitted with the whisk attachment, begin whipping egg whites until frothy. Add cream of tartar and continue to whip until stiff peaks begin to form. Gradually add sugar and whip to incorporate to stiff peaks. Wipe the whisk attachment clean and using another bowl (or use the same bowl after removing the whipped egg whites and wiping the bowl clean), whip the 2 whole eggs with the confectioners' sugar, almond meal, and salt. Whip until mixture thickens a bit and looks pale-yellow, scraping the bowl as necessary. Add 1 1/2 teaspoons matcha powder and mix on slow speed to combine. Sift flour over the egg and matcha mixture. Then take 1/3 of the egg whites and fold it into the batter using a large rubber spatula. Add remaining egg whites and fold gently until just combined. Pour batter into prepared pan. Use an offset spatula to evenly distribute and even out the batter across the pan (be gentle so as not to deflate the batter). Bake for about 5-6 minutes; cake will be set and a cake tester comes out clean. Keep a close eye on it since the cake can quickly overbake and burn. Remove cake from the oven. Set a piece of parchment paper on top of a cooling rack. Run a butter knife around the edges of the cake and invert it on top of the parchment lined cooling rack (this helps prevent sticking). Gently remove the parchment paper attached to the cake. Let cool slightly then slice cake into 3 even pieces. Make cocoa cream filling: Place heavy cream in a bowl of a stand mixer fitted with the whisk attachment. Start beating the cream. Gradually add sugar, then cocoa powder. Add vanilla extract and continue to beat until cream reaches stiff peaks. Assemble layer cakes: Spread half the cocoa cream filling evenly on top of one cake layer. Stack a second layer on top of it and spread another layer of cream over top. Place last plain cake layer on top. Chill cake in the refrigerator for about 1 hour. Before serving, remove cake from the refrigerator and slice into 4 portions. Dust the top with a little more matcha powder. Beautiful! 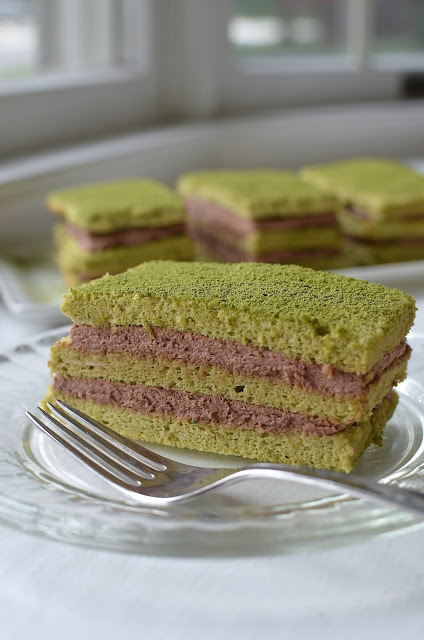 And what I love the most is the add of almond meal in the matcha sponge. An excellent layered cake to enjoy with the family. How nice that he got a dessert he wanted for Father's Day, and you got to remake an old dessert in a new way! I'm so glad I was able to re-make it for him...and he's now "salvaged" it so this becomes a recipe that's likely to go into our regular routine. Can't beat that. What a wonderful cake you made for your husband, Sounds like you all had a wonderful day together. Take care! He is so laid back but I am happy to do a little something for him. All the better if he has a craving for something... Hope you had a nice weekend. Enjoy all the sunshine! Awww...how kind of you. Thank you! So glad you were able to do a redo of this cake for your husband! I absolutely loved the first one you did and this updated version is even more amazing! The cake looks so soft and spongy and I'm sure your husband enjoyed every last bite :) Just beautiful! Thanks so much, Kelly! It really is so soft and spongy, with a great mild flavor that works really well with the filling. It makes a great bite all in! Thanks again! There's nothing like making something good to feed your family, right! : ) Thanks, Medha. I am the red bean lover in this house, so I'm not sure I can talk the fellas into swapping out the cocoa cream filling! Thanks, Monica! Isn't it funny .... my husband always ends up requesting things that I wasn't happy with (but looking back I always realize that even though it didn't turn out how I wanted it to it was delicious!). This re-do looks fantastic! Thanks, Ashley! I'm glad he asked for it - it was the motivation I needed to "fix" it. : ) Have a great week! Oh yeah - matcha crepe cake like the ones at Lady M are incredible, right?! Love a light spongy cake. My husband bought me matcha powder for Christmas and I've only used it once so far. I have to try this cake! I LOVE the green color. That color is a little mesmerizing - I think that's somewhat the appeal behind matcha desserts. Same with pistachios. I know it tastes wonderful but the color totally draws you in at first! Hope you try it! This is gorgeous! Going back to a recipe to better it is something I often wish to do but not always able to. I am glad you remade it, though I was impressed with the earlier one as well. I wish I could have a taste! Matcha is such a big thing right now. This looks perfect!